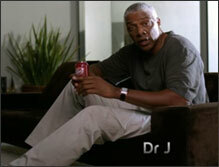 Far be it from me to question Julius Erving’s medical credentials, but we’d love to know the scientific procedure that was used to determine that Dr Pepper needs to be consumed slowly, as the former NBA great suggests in this new ad. Same goes for Dr. Frasier Crane, who dishes out similar advice on his radio show in another ad. Both spots are part of a big new campaign touting the drink’s 23 flavors. How many fake doctors does it take to come up with 23 synonyms for “sugar”? Sadly, two of the field’s brightest stars have burnt out: Dr. Zachary Smith could have made awkward, possibly gay advances toward Dr Pepper to test its potency, and Dr. Hunter S. Thompson could have just blown up cases of the stuff with homemade explosives. No amount of slow-motion three-pointers could match that.